Join our Lisbon bus tour and marvel at the amazing sights of old Lisbon! Be amazed by the 3D reconstructions of the Roman period and the earthquake of 1755, two of the many videos you will watch along the way. 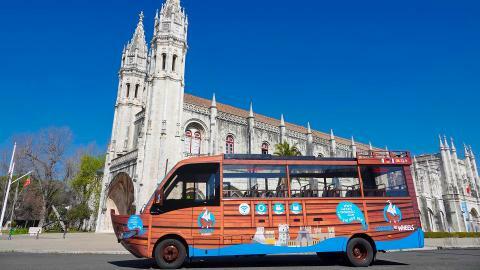 Venture into old neighbourhoods like Alfama, Mouraria and Belém in a unique bus inspired by the Age of Discoveries! Relax as the GPS guide powers over 40 videos and enjoy the 30 additional points of interest that create a tailor-made experience in your own language. Get tips on places to visit, contemplate neighbourhoods and see the interior of many top attractions without having to get off the bus. 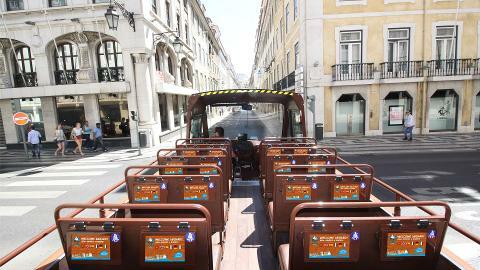 You will board one of our 29-seater panoramic sightseeing buses, opened or covered according to the weather, one of the few buses allowed into the heart of the old city of Lisbon. Tours depart on time and you need to be at the stop 10 minutes before tour time. From the city centre, right on Lisbon Downtown area (BAIXA) and a few steps away from the famous Praça do Comércio. 10-minute stop in Belém by the Monastery of Jerónimos. Children aged 2 and under may ride for free on adult's lap. 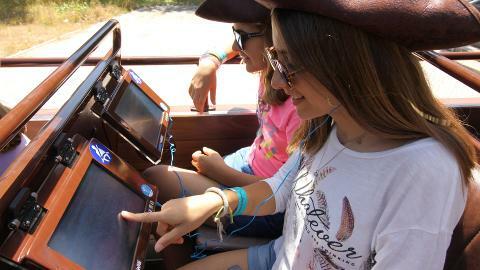 All tours are accompanied by the driver and also an assistant fluent in Portuguese and English. 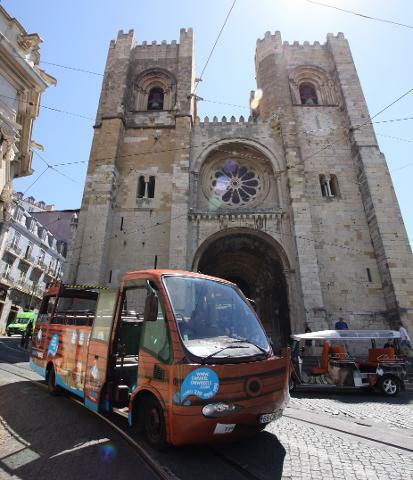 Lisbon with kids: This is a family-friendly tour ideal for all ages, so if you are in Lisbon with kids we would love to welcome you. Small strollers can be stored in the trunk, according to the space available. Groups in Lisbon: If you are part of a large group in Lisbon we have private tours in Lisbon for groups that can be customized for your group's needs. Small groups with over 16 people also have special prices. Please inquire by email. 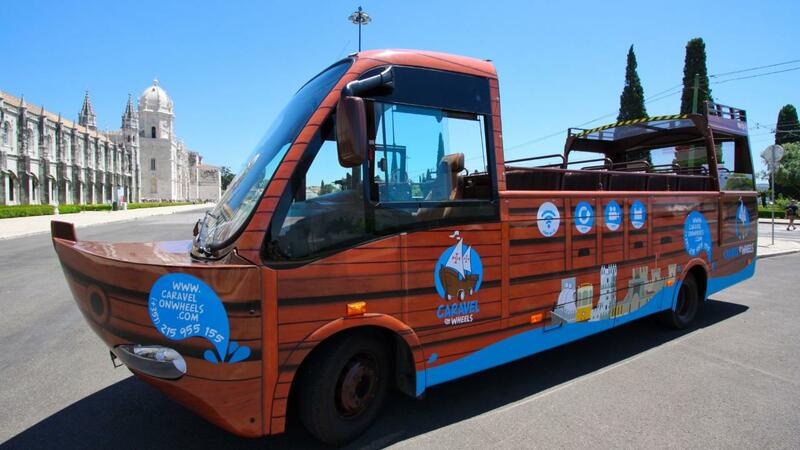 Cruise passengers in Lisbon: we have a special tour in Lisbon that picks-up passengers from the port. 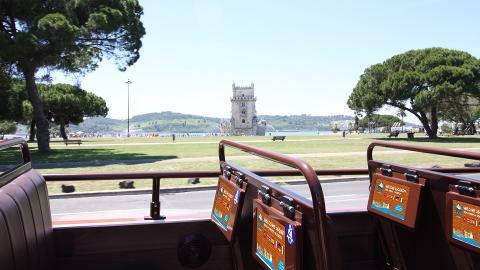 If you are arriving in Lisbon on a cruise ship and want to see Lisbon top attractions on a bus tour from the cruise terminal, please book our Lisbon shore excursion.